United Launch Alliance has launched a National Reconnaissance Office payload and 13 CubeSats for the Government Rideshare Advanced Concepts Experiment aboard an Atlas V rocket as part of the NROL-55 mission. The Boeing–Lockheed Martin joint venture said Thursday the mission is in support of national defense and is the company’s 10th launch since the beginning of the year. 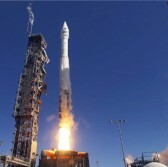 Jim Sponnick, vice president of Atlas and Delta programs at ULA, noted that the company worked with NRO’s office of space launch and the U.S. Air Force to prepare for the mission. The 13 CubeSats include nine NRO-sponsored nanosatellites and four NASA-sponsored nanosatellites. “The GRACE CubeSats will perform missions demonstrating tracking technologies [and] software-defined radio communications and will also conduct other measurements and experiments,” Sponnick said. According to ULA, NASA’s Jet Propulsion Laboratory, the U.S. Army‘s Space and Missile Defense Center, SRI International, Aerospace Corp., AMSAT, Tyvak, University of Alaska – Fairbanks and Salish Kootenai College developed the CubeSats. Aerojet Rocketdyne provided the RL10C-1 engine to power the Atlas V rocket’s Centaur stage.